Researchers have constantly been developing new materials that are stronger and lighter than ever before, paving the way for more energy-efficient and eco-friendly future including everything from transportation to medical technology. In automotive industry, the legislative pressure to reduce the carbon emissions being produced is continuously giving research and development importance as well as urgency within the area of lightweight materials. Using lightweight materials can reduce overall weight of the vehicles by 30-47%. Not only the automotive engineering is using lightweight materials, huge demand for affordable urban housing is also met by light building construction techniques such as use of recycled plastic in the form of polypropylene and use of rice husks. Energy sector, such as in wind energy, light weight composites is an important material to increase the power production. Goldstein Research analyst forecast that the global biopolymer packaging market size is set to reach USD 259.6 billion by 2024 growing at a CAGR of 6.6% over the forecast years. The technological advancement, increasing rate of adoption of lightweight materials, making vehicles fuel efficient, government initiatives towards defense, environment and infrastructure development are some of the factors raising the demand of lightweight materials and pushing the market to grow as per the forecast. The report covers the present ground scenario and the future growth prospects of the lightweight material market for 2016-2024 along with the sales and revenue of the lightweight material. We calculated the market size and revenue share on the basis of revenue generated from major players across the globe. We have forecast the market on the basis of new inventions in the area of lightweight materials, rate of penetration of lightweight materials in various sectors of the economy, new product launches using lightweight materials, mergers and acquisitions of the companies involved in lightweight materials, government spending and the raw material availability in various regions of the world. On the basis of material type, metal alloys accounted for 56.4% market share of the total global lightweight materials market. Lightweight metal alloys are highly used in automobiles and aviation industry in manufacturing of various aircraft parts and chassis of the vehicles. Polymers segment will continue to grow at a highest CAGR of 5.1%, with its major application in automotive industry, consumer goods and many more. Lightweight material market outlook 2016-2024, has been prepared based on an in-depth market analysis from industry experts. 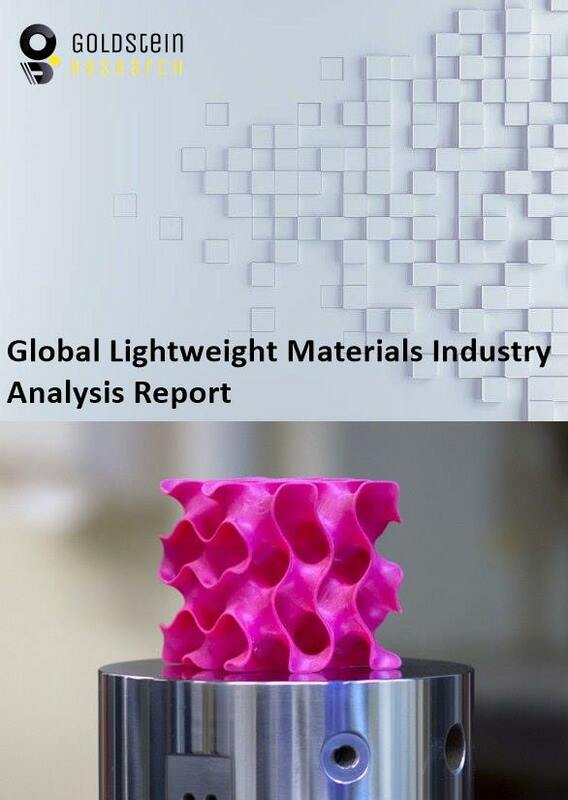 The report covers the competitive landscape and current position of major players in the lightweight material market. The report also includes porter’s five force model, SWOT analysis, company profiling, business strategies of market players and their business models. Global lightweight material market report also recognizes value chain analysis to understand the cost differentiation to provide competitive advantage to the existing and new entry players. There is a rising trend of green manufacturing thus, developing micro- and nano-cellulose composites, natural fiber composites and related manufacturing processes for automotive and aerospace applications. Structural bamboo fibers and a polymer matrix is an example of strong and lightweight composite material that even absorbs lot of CO2 from the environment. According to the report, major driving factor for the growth of lightweight material market is the growth of various sectors of an economy such as aviation, defense, automotive, construction and energy. The government expenditure in these sectors is demanding lightweight materials to compete with other economies in terms of efficiency, strength, durability. In 2016, the 14.65 million light vehicles were assembled in the North America using plastics and polymer composites valued at USD 5.7 billion. Further, the major challenge for the global lightweight material is the rapid fluctuation in the raw material prices and their limited availability. This will keep hampering the production process of the various parts, severely impacting the economic state of a country. Based on geography, North America has the largest market share of 39.8% in 2016, of the total global lightweight material market, with the automotive industry being the largest manufacturer and consumer of these materials. Asia-Pacific is growing at a fastest rate of 6.3% CAGR on the back of rapid development in the multiple sectors such as automotive, construction, defense, and energy. China holds the largest share of 55.6% of the APAC lightweight material market with major emphasis on the energy and automotive industry to reduce weight and increase efficiency. Global lightweight material market report comprises of the following companies as the key players in the lightweight material market: Toray Industries, Teijin Limited, Mitsubishi Rayon Co. Ltd., SGL Group, Hexcel Corporation, Solvay S.A., Owens Corning Corporation, Dead Sea Magnesium Ltd., Titanium Metals Corporation, Vsmpo-Avisma Corporation, ALCOA Inc., Novelis Inc., Arcelor Mittal S.A., Rio Tinto, China Hongqiao Group, Thyssenkrup AG, Lyondellbasell Industries N.V., Formosa Plastic, and SABIC. What is the revenue of lightweight material market in 2015-16 and what would be the expected demand over the forecasted period?